Joseph Bruchac lives in the Adirondack mountain foothills town of Greenfield Center, New York, in the same house where his maternal grandparents raised him. Much of his writing draws on that land and his Abenaki ancestry. Although his American Indian heritage is only one part of an ethnic background that includes Slovak and English blood, those Native roots are the ones by which he has been most nourished. He, his younger sister Margaret, and his two grown sons, James and Jesse, continue to work extensively in projects involving the preservation of Abenaki culture, language and traditional Native skills, including performing traditional and contemporary Abenaki music with the Dawnland Singers. He holds a B.A. from Cornell University, an M.A. in Literature and Creative Writing from Syracuse and a Ph.D. in Comparative Literature from the Union Institute of Ohio. His work as a educator includes eight years of directing a college program for Skidmore College inside a maximum security prison. With his late wife, Carol, he founded the Greenfield Review Literary Center and The Greenfield Review Press. He has edited a number of highly praised anthologies of contemporary poetry and fiction, including Songs from this Earth on Turtle’s Back, Breaking Silence (winner of an American Book Award) and Returning the Gift. His poems, articles and stories have appeared in over 500 publications, from American Poetry Review, Cricket and Aboriginal Voices to National Geographic, Parabola and Smithsonian Magazine. He has authored more than 120 books for adults and children, including The First Strawberries, Keepers of the Earth (co-authored with Michael Caduto), Tell Me a Tale, When the Chenoo Howls (co-authored with his son, James), his autobiography Bowman’s Store and such novels as Dawn Land, The Waters Between, Arrow Over the Door and The Heart of a Chief. Forthcoming titles include Squanto’s Journey (Harcourt), a picture book, Sacajawea (Harcourt), an historical novel, Crazy Horse’s Vision (Lee & Low), a picture book, and Pushing Up The Sky (Dial), a collection of plays for children. His honors include a Rockefeller Humanities fellowship, a National Endowment for the Arts Writing Fellowship for Poetry, the Cherokee Nation Prose Award, the Knickerbocker Award, the Hope S. Dean Award for Notable Achievement in Children’s Literature and both the 1998 Writer of the Year Award and the 1998 Storyteller of the Year Award from the Wordcraft Circle of Native Writers and Storytellers. In 1999, he received the Lifetime Achievement Award from the Native Writers Circle of the Americas. 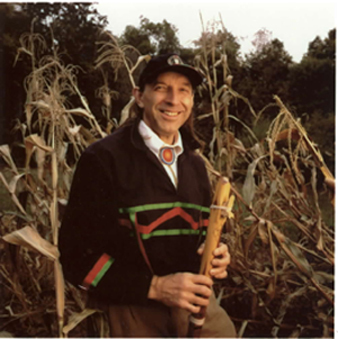 As a professional teller of the traditional tales of the Adirondacks and the Native peoples of the Northeastern Woodlands, Joe Bruchac has performed widely in Europe and throughout the United States from Florida to Hawaii and has been featured at such events as the British Storytelling Festival and the National Storytelling Festival in Jonesboro, Tennessee. He has been a storyteller-in-residence for Native American organizations and schools throughout the continent, including the Institute of Alaska Native Arts and the Onondaga Nation School. He discusses Native culture and his books and does storytelling programs at dozens of elementary and secondary schools each year as a visiting author.